In rural America, children face the prospect of a compromised future. Class of '27 focuses on early childhood education in struggling communities, highlighting the efforts of people guiding children toward graduating high school in '27. United by hope, inspiration and resiliency, the film shows that children are most likely to grow into productive adults if they receive support in the early years. Airs on WXXI World. Filmed in the hollows of Appalachia, on native lands of the Upper Midwest and in West Coast migrant camps, Class of ’27 presents distinct yet complementary personal stories from places too often ignored in America. Each of the three portraits demonstrates that children from distressed communities, despite their circumstances, are more likely to grow into productive and civically engaged adults if they receive support in their earliest years. Committed to supporting the children’s potential, each community is a place of hope, inspiration and resilience. The first portrait follows preschoolers in Booneville, Ky. With local employment largely limited to the school system, these children have caring and competent adults preparing them for better futures. “I’m getting them ready for kindergarten,” says Betsy Coomer, a tireless early-education teacher with decades of experience. At the same time, Cleda Turner of Owsley County Outreach, organizes food packets for hungry children to take home for the weekend on Fridays after school. The third portrait follows Mireya and her parents from Fresno, Calif., to Oregon’s Willamette Valley for berry season. Mireya’s parents, who are migrant workers and speak Spanish and Mixteco at home, face work days as long as 12 hours. 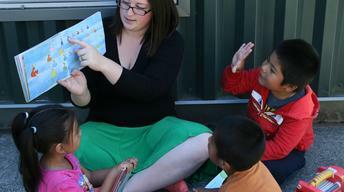 They enroll her in Migrant Head Start where bilingual teacher, Aimee Brown, makes it a warm and engaging academic experience that includes meals and outdoor play. Each short film in Class of ’27 opens with a reflection by award-winning writers Silas House, Gyasi Ross and Sandra Cisneros, who frame each story with authenticity and insight.